Deena was born and raised is New York. She started singing at the age of 9 with The Metropolitan Opera where she stayed for 7 seasons and performed in over 250 performances, soloing in Tosca, Die Agyptische Helena, and Hansel und Gretl. Although her first memories were singing Beauty and the Beast during nap time to the rest of her sleepy kindergarten class, she decided to retire from opera at the ripe age of 16 and turn her sights to Musical Theater. 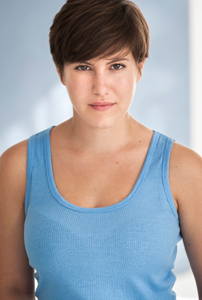 Deena received her BFA from NYUs Tisch School of the Arts and performed in a handful of shows during her time there including: Words, Words, Words (Milton), Into the Woods (Cinderella), and The Girl Who Was Plugged In (P. Burke). Since graduating, Deena has performed in various shows, concerts, and competition (She loves the Spotlight) including “Stonewall Sensation” which eventually carried her to the Duplex. Deena has been bartending for the past 4 years and loves every minute of it. At the Duplex, she gets to fulfill both her passions: singing and booze! Come visit Deena at the Duplex – She promises to make all your musical and alcoholic dreams come true.